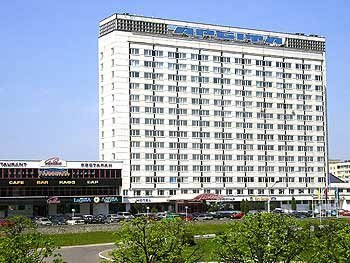 The Orbita Hotel is a modern 3-star building with comfortable rooms and a wide range of facilities. The hotel started its work in 1991. It is situated in the western part of Minsk not far from the city centre. The hotel offers accommodation in 276 rooms of various categories. Each room features international and long-distance telephone connection, satellite TV, radio, a comfortable bathroom. Business-class rooms, Apartments, Suites are equipped with soundproof and air-conditioning systems, minibars, and safe deposit boxes. The Orbita restaurant offers a wide choice of both national and European cuisine including specialties. The hotel's 3 banquet rooms offer a great variety of banquet menus, a wide choice of drinks and deserts, elegant atmosphere and remarkable service that will assure a perfectly arranged business or social meeting. The hotel also features an Italian pizzeria which are open til 5 a.m.
For personal needs and business meetings the Orbita Hotel has a conference hall, which is capable to arrange up to 55 seats. It is well-equipped with modern conference facilities: a large round table, a rostrum, a TV-set, a video player, a flip chart, a multimedia projector. Also guests can rent a negotiation room (for up to 10 persons). Other facilities of the hotel include: free Wi-Fi, parking, laundry service, parking, a casino and a night club, a luggage room, currency exchange and others.